A toasted cinnamon raisin bagel with butter or cream cheese. Oven baked frozen chicken nuggets dipped in honey. Bah! You guys, these were once my favorite go to meals, emphasis on the were. If you had told my thirteen year old self that one day a big bowl of seeds and trees and leaves would be my favorite thing to eat on any given weeknight, I would have probably laughed in your face. My poor mother might have fainted. But indeed, times have changed and while I still totally believe that there is a time and place for a good bagel, chicken nuggets have long since hit the road. 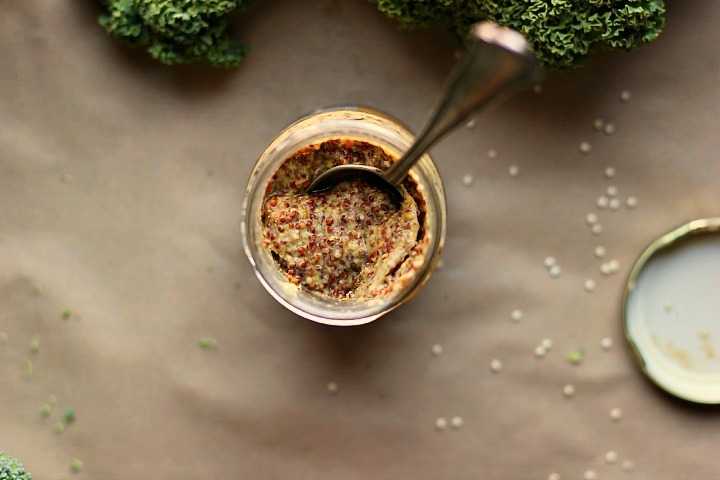 We go through a lot of mustard in this house, which you might not guess by looking through this blog. If living and eating and cooking in France for a few years has taught me anything it’s that a jar of mustard can go a long way, and that a simple green salad dressed in a good mustardy dressing is the perfect accompaniment to almost any meal. I always opt for the grainy kind, because – so pretty! – and because I much prefer the rustic flavor. A jar of the good stuff has a permanent place in our fridge door shelf between the miso paste and the almond butter, the staples – you know. I often think that each week the recipes I post here have to be totally original, never been seen before, blow your taste buds away incredible. But that’s not very realistic is it, and it’s not at all how I eat on a day to day basis. So I imagine that all you out there are busy, hard working folk trying to fit in some aspect of a social life and are just looking for some simple and nourishing ideas for an easy dinner that doesn’t involve cream cheese or frozen chicken. 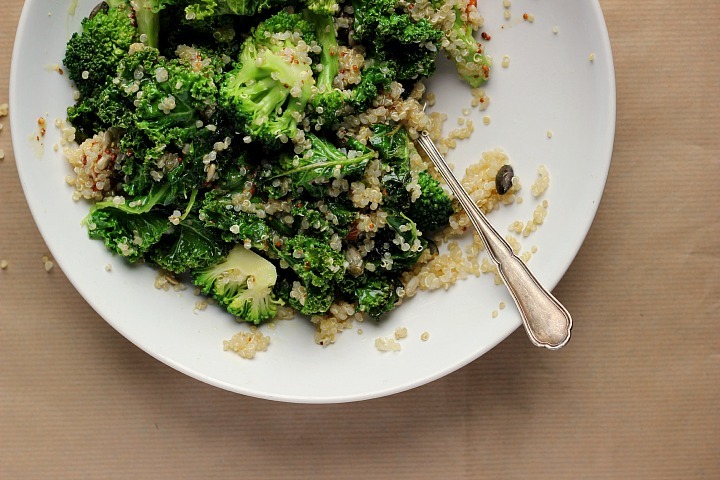 This bowl of green goodness is one of my favorite recipes to keep in my back pocket for those nights when I just can’t be bothered to really ‘cook’ and I’m all out of toast and hummus. Just a simple, warm salad with only a few ingredients to get you through these last bouts of winter. Almost there. Can I say that leftovers of this salad are almost better than the real deal? I guess that’s always the case, isn’t it? 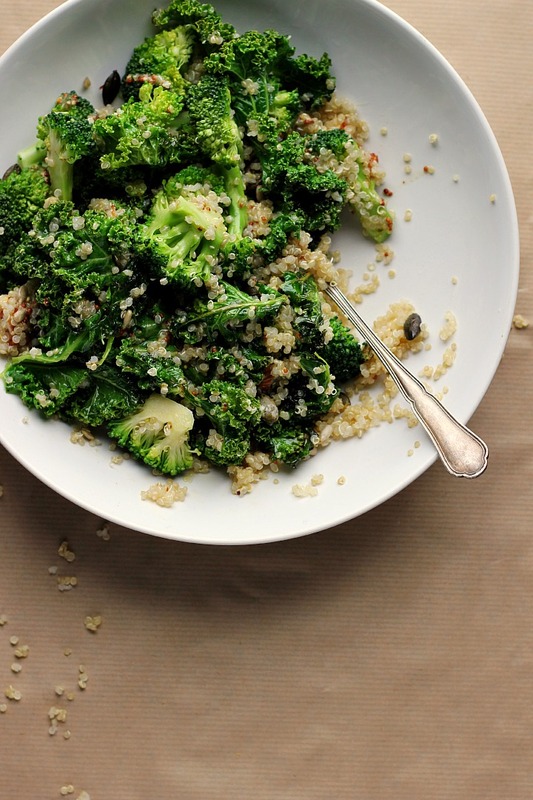 The broccoli and kale are sturdy enough to stand up against the dressing in the fridge, so dressed leftovers can be kept for a day or two without getting soggy. Talk about bestovers, you guys. 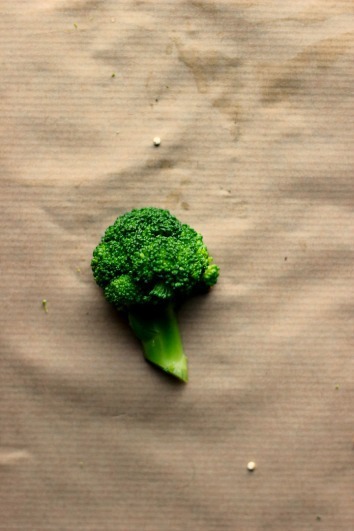 I like to steam my broccoli until just tender and vibrant green, more ‘blanched’ than ‘cooked’, but if you prefer a different texture or cooking method, feel free to go with that. It is important, however, to let the kale crisp up a bit around the edges, the flavor is reminiscent of toasty kale chips and add great crunch to this salad. Vegan + Gluten Free. Served 2-4. 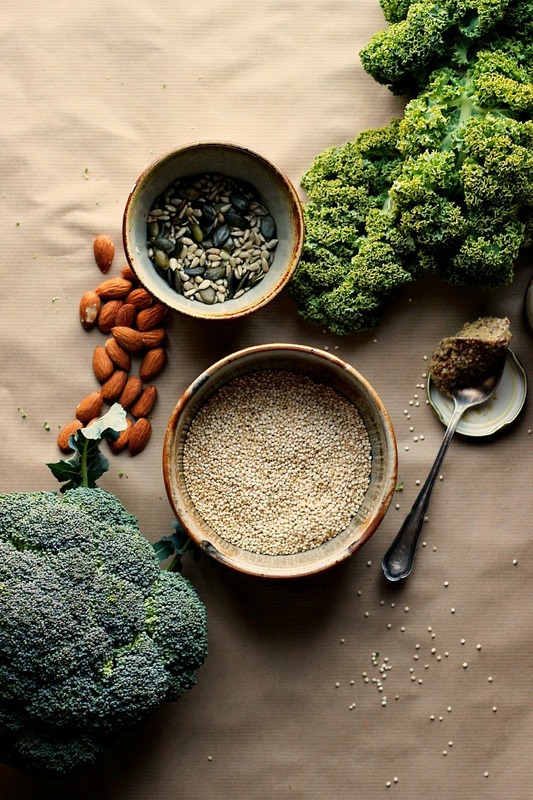 Start with the quinoa. Rinse the quinoa under cold water in a metal sieve for about 30 secs. Add rinsed quinoa and 1 cup water to a pot and season with salt. Bring to a boil, then cover and simmer for 15 minutes, until quinoa has increased in sized and absorbed most of the water. Remove from heat and let sit with the lid on for another 5 minutes before fluffing with a fork. 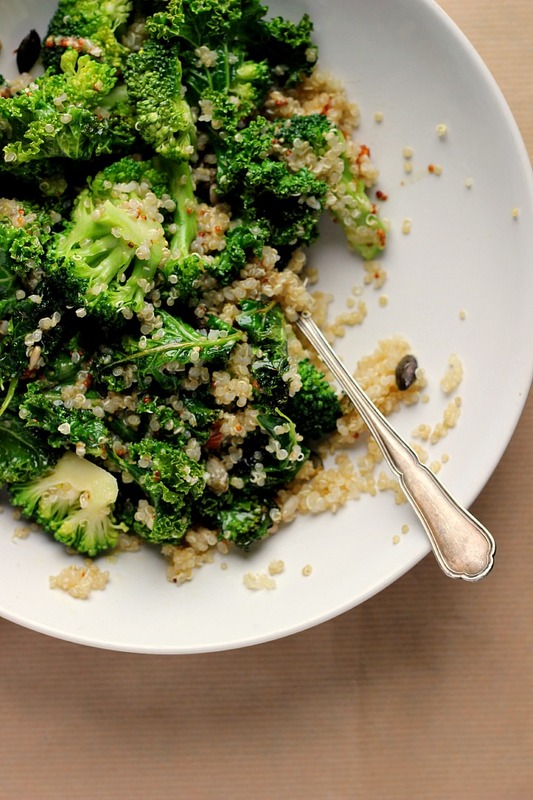 While the quinoa is cooking, steam the broccoli in a double boiler or blanch it in a pot of boiling water for a minute or two. 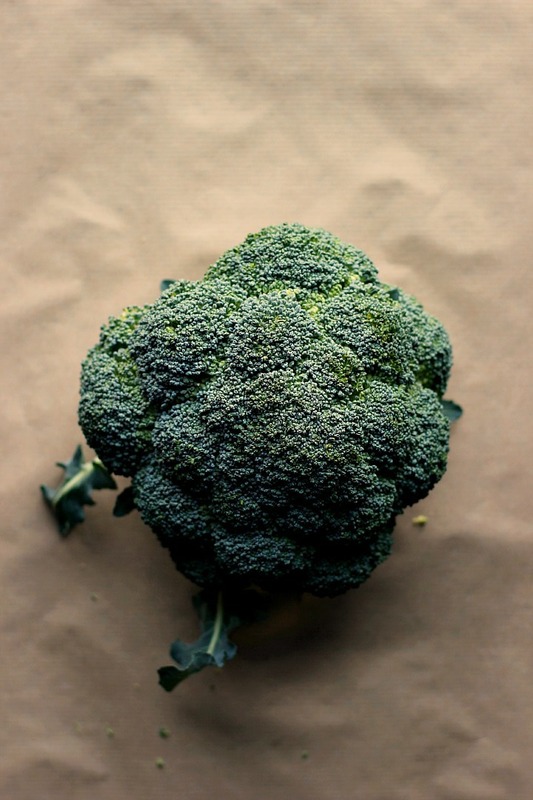 Once the the broccoli is vibrant green the the tops of the florets are tender, drain and rinse under cold water, set aside. Remove the kale leaves from the stems and give the leaves a rough chop. Add a drizzle of heat resistant oil to a hot pan, then toss in the kale leaves with a good pinch of salt. Sautée the leaves until just some are starting to get crispy around the edges. Remove from heat. 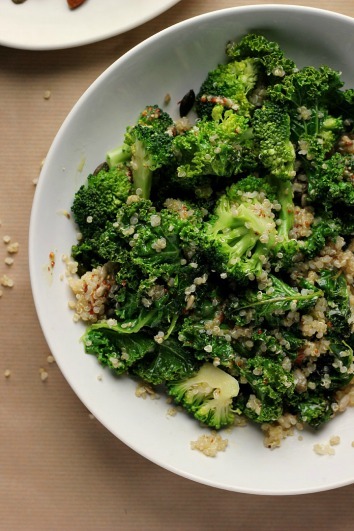 Toss cooked quinoa, steamed broccoli and crispy kale leaves together in a large bowl. Whisk together grainy mustard, vinegar, olive and black pepper and then pour over the salad. Top with raw almonds and toasty seeds. Serve warm or refrigerate for later. Yes yes yes to easy and delicious dishes. 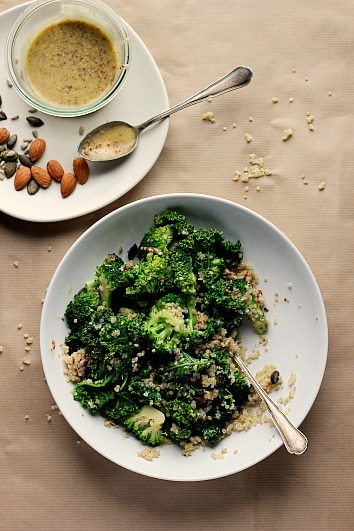 I love mustard and this salad looks perfect for quick and healthy weekday dinners. I’m starting to prefer those healthy, nourishing foods over ‘bad’ things too, but totally agree on moments where we still enjoy these bagels or nuggets. 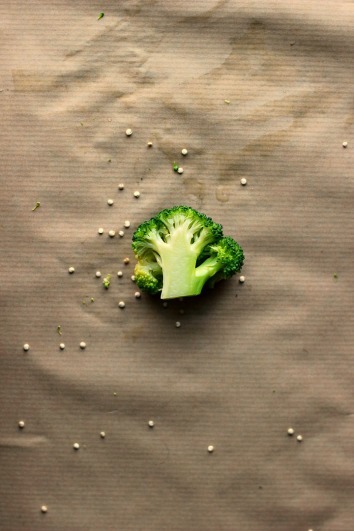 Love the shot of the broccoli! This dish is pretty much everything I love in one bowl. When I’m not eating green bowls like this one, it’s usually avocado on toast or oatmeal if I’m feeling lazy. Simple really is best! I made this for the first time this evening for my boyfriend, who is a vegetarian. It is mega tasty and satisfying! Which is just awesome considering it is super easy to make and very healthy. An instant favorite I can see this being a regular in my weekly meal arsenal. Variations recommendations: I substituted Kale with raw baby spinach leaves to give it more of a leaf salad vibe and added sun dried tomatoes for colour and feta cheese because I can’t eat a salad without cheese in it! Thanks for such a great dish! I’m excited to try other things from your website now! My boyfriend and I both found the mustard taste really overpowering, I could hardly taste the other ingredients. I like mustard but in small amounts. I’m not sure if the problem is the type of mustard I used (inglehoffer organic stone ground mustard) or if it’s just that I’m not as big of a fan of mustard as everyone else seems to be. I would really like to find a way to tweak this recipe to better suit my pallet but I’m just not that experienced of a cook. Any suggestions would be greatly appreciated! Thank you! I think this is very tasty and I especially enjoyed it with grilled salmon.